Stephanie ~ YMCA Norton Commons swimming. Guaranteed good weather all year long! Maggie ~ We love the Northeast YMCA. My kids can do rock climbing and arts and crafts while we exercise or even just relax in the lobby. It’s the perfect place for the whole family! Karen ~ I’ll be honest, we like to go to the indoor parts of the Louisville Zoo (HerpAquarium). If the weather is not TOO COLD, we will take our time walking to each area, otherwise we’ll go right into them and take our time once inside each. We do mostly outdoor things in the spring-fall months at the zoo, then take it inside in the winter to really study those animals. Added bonus – the zoo is normally empty in the winter, so plenty of “viewing room” in each indoor exhibit! Nicolle ~ We love the Oldham County YMCA, but we rarely get chances to all go together. The Oldham County Main Library has family craft nights and fun games to check out for a couple of hours! Tami ~ We love Barnes and Noble at the Paddock Shops. We stop at the cafe for a juice box (and coffee for mom) then browse the books and toys. We often do our own storytime on the stage. 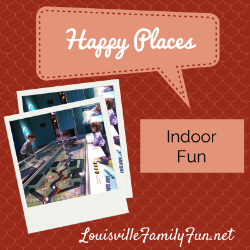 Kimberly ~ We love to go to the Kentucky Science Center for indoor fun. My kids can spend hours exploring and playing. We usually make a visit to subway next door to refuel. Can’t wait for the newly renovated ‘science in play’ area to open next year! Erin ~ We truly do the most indoor fun at the Louisville Free Public Libraries probably, esp in winter. And for my oldest-that’s where she likes to go or Sky Zone. My youngest likes to go to the play area at Oxmoor or Chick-Fil-A too and the children’s library space at the new Southwest library is incredible. We also make lots of trips to Feeder’s Supply to see the animals. Caryn ~ I’ll be the bad mom and say the indoor play place at the McDonald’s in Stonybrook and Middletown. What can I say, my kids love fries. We also like to walk around Bass Pro Shops and Cabela‘s, and look forward to adding that new Outdoor Sports place in Middletown to the list of places like that. Brandy & Jeanette ~ It seems in the winter time, our happy place is home. Especially, around the holidays when there are so many obligations (see our Holiday List here). We really value those fleeting moments when we can hang out (at home or a friend’s house to chill) and watch movies, play games and goof around.